There are a many open source CMS available under GNU license and one of them is Drupal. Here nilaxsoft tried to explain some benefits of using Drupal platform. Drupal is probably the best and most popular content management system in the market today. It is also Software as a service (Saas) solution which can be used by organizations irrespective of their size or location. 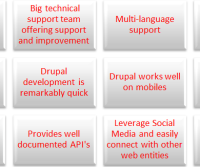 We look at the benefits of Drupal application development. Drupal is open source, easily available and highly customizable. There exist thousands of Drupal modules and templates a majority of which are available at zero cost. Hence, many small players are able to use it. Drupal is used and trusted by several individuals and organizations globally as it provide both high value solutions and robust security. A large team of full time developers are working on Drupal full-time. Also Drupal enjoys the solid and unwavering backing of people who genuinely care about its functionality and performance. It provides users easy and no cost access to both future and current technical upgrades and security improvements. Drupal offers support for more than 150 languages. Hence it is perfect to serve a truly global audience. Drupal offers high performance business tools and is easily maintainable. Some of its advantages are ease of scalability and constant updating of the software. Drupal doesn’t have quite a number of the restrictions of older CMS software. It is ideal for web design owing to its flexibility and features which help create highly interactive and user friendly web services. Today the speed of development determines the success and market acceptance of both products and services. In the current era of rapidly changing technology and marketing it is vital to be faster than competitors. Else your firm will be left behind and your products/services will become obsolete. Hence you can tap the enormous and fast growing global smartphone markets. There is no need for developers to worry about user experience, customization, optimization and other issues. Drupal is specifically designed to effectively address all the mobile environment requirements. This makes it the ideal CMS for the mobile. Additionally the use of special themes makes Drupal suitable and friendly to the mobile platform. SEO (Search Engine Optimization) is an indispensable and highly important requirement today. Drupal has powerful and sophisticated SEO functionality which makes it SEO friendly. The SEO modules present in Drupal are a valuable and beneficial feature in any business’s marketing efforts. Many leading and important entities such as the White House and FedEx have adopted and placed their trust in Drupal. This adds to the CMS’s credibility as well as reliability. This makes Drupal application development, both easier and organized, making the job of developers simpler and more effective. Drupal offers robust support for social media integration and has easy connection capabilities to other sites and services. Drupal developers need not develop everything from scratch. Not much programming is required and new features can be easily added by the developers. Drupal has currently a huge repository of over 16,000 modules which can practically fulfill almost all the site requirements. Thus, both time and money are saved and application development becomes simple and easy. Why Nilaxsoft started web development services in Raipur ,Chhattisgarh ? Nialxsoft is first company which is started web development in Bhiali ,Chhattisgarh. Now the question is why Chhattisgarh ? Since the beginning, Nilaxsoft focused on providing the best development services to the customers . Whether we’re designing a new web application or changing the look of the homepage, we take great care to ensure that they will ultimately serve you, rather than Nilaxsoft internal goal or bottom line. As we born in Chhattisgarh so we are very much familiar with chhattisgarhi peoples problems which is related to web world.We started our carrier from metro city in India.When we spent some years on metro area we missed our quietness as well as our family and our friends. So we moved our native area and started web development in chhattisgarh. We do website design, website / web application development. we know what we do well, and how we could do it better. Through continued iteration on difficult problems, we’ve been able to solve complex issues and provide continuous improvements to a service that already makes finding information a fast and seamless experience for millions of people. Our dedication to improving coding standerds helps us apply what we’ve learned to new projects, like Tour and Travel web portal development , HRM or CRM development etc. Our hope is to bring the power of search to previously unexplored web world areas, and to help people access and use even more of the ever-expanding information in their lives. First is better than second. We know your time is valuable, so when you’re seeking an answer on the web you want it right away–and we aim to please. We may be the only people in the world who can say our goal is to have people leave our website as quickly as possible. By shaving excess bits and bytes from our pages and increasing the efficiency of our serving environment, we’ve broken our own speed records many times over, so that the average response time on a search result is a fraction of a second. We keep speed in mind with each new product we release, whether it’s a mobile application or web browser, a browser designed to be fast enough for the modern web. And we continue to work on making it all go even faster. If you are looking for a company who can accomplish your Web development ,Web design ,Web portal and other web related task then Nilaxsoft is best place for this service. Everyone has heard the term “CRM” if you are a business owner or sales manager or business partner. But do you know what does it really mean? C-R-M stands for Customer Relationship Management. At its simplest, a CRM system allows business owner to manage business relationships and the data and information associated with them. With CRM, you can store customer and prospect contact information, accounts, leads and sales opportunities in one central location, ideally in the cloud so the information is accessible by many, in real time. While a CRM system may not elicit as much enthusiasm these days as social networking platforms like Facebook or Twitter, any CRM system is similarly built around people and relationships. And that’s exactly why it can be so valuable for a fast-growing business. Any business starts out with a foundation of great customer relationships. You, the seller, connect with people who need your product. Yet, as your company grows, these business connections grow more sophisticated. It’s not just a transaction between the buyer and seller. You start to manage a myriad of connections, across time, within each company you do business with. You need to share information across various teams within your own organization who are making contact with the same customers. A CRM system can serve as a vital nerve center to manage the many connections that happen in a growing business. For small businesses, a CRM system may simply help you put your data in the cloud, making it accessible in real time, across any device. But as you grow, a CRM can quickly expand to include more sophisticated features to help teams collaborate with colleagues and customers, send customized emails, gather insights from social media conversations, and get a holistic picture of your business health in real time. If you looking to know more about CRM just drop us mail at info@nilaxsoft.com . Nilaxsoft HRM (Human Resource Management) application release for production. HRM is developed for small and big size companies which is related to human resource team. Nilaxsoft dedicated team can fully customize HRM application according to your need. We have tried to cover all functions which is perform by HR. As we know each company has its own, or multiple expressions of its own, unique culture. Also called organizational culture, this encompasses the values, visions, ideals, norms, working language, systems and habits of a group who work together. A good human resources employee develops and manages their company’s culture. They recruit new hires, maintain benefits and payroll, mediate conflict and engage in training and development. Their role is at the core of a company’s success. If you are looking for paper less, manageable HR section try our HRM solution.